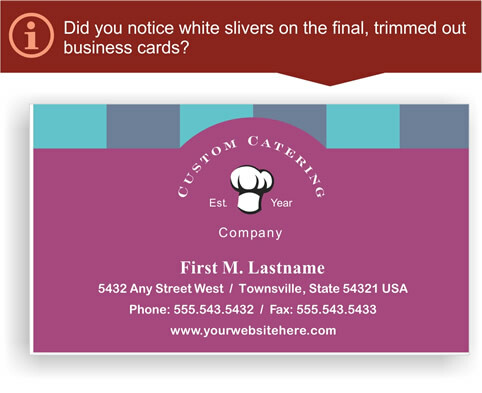 Imagine you have an artwork for business cards. You set your page size at 3.5" x 2.0". There is a slight shift during the production which can be up to 1 mm. So what will happen is your artwork will be shifted and you may have a sliver of white on your business cards on the side it shifted. 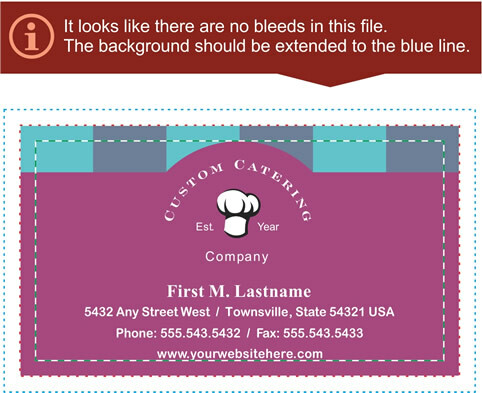 In order to avoid that, you will need to create bleeds in your file, which is basically extending your background bigger, so that during manufacturing process you don't get white sliver on your design. 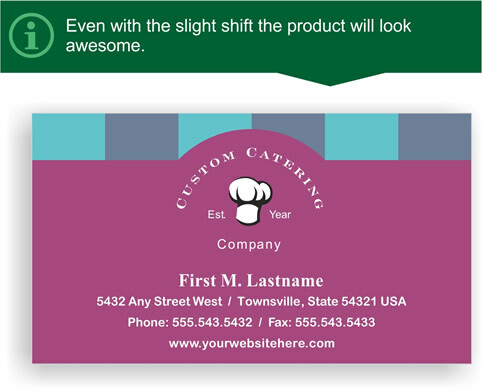 For the business cards in this case, you would need extend each side by 0.125" (1/8"), so your final page size will be 3.75" x 2.25". Take a look at example below - the file without bleeds. Because of small possibility of a slight shift during production, we recommend to keep all design elements like text, logo and any images that are not part of the background inside a safe zone. By keeping your elements inside a safe zone you will avoid trimming off important design elements. Usually a safe zone is indicated by dotted or solid green line. Suggested minimum safe zone for business cards is 0.125" from each side. Take a look below for an example of the design with element outside safe zone. So, how should my file look like? 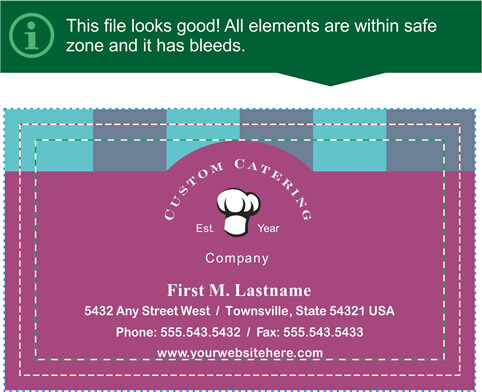 A proper file should have bleeds and all design elements should be inside the safe zone. This way any slight shifts during production will not affect the final result of the trimmed product. Take a look an example below. Are bleeds and safe zone vary? Yes. Depending on the product. Each product on our website will indicate required bleeds and safe zone under file specifications. Some products may have blank software templates that you will be able to download and use to check your work or start a new project. How would I know if my file setup properly? While using our file uploading tool for the product, it will show you guides for bleed and safe zone. 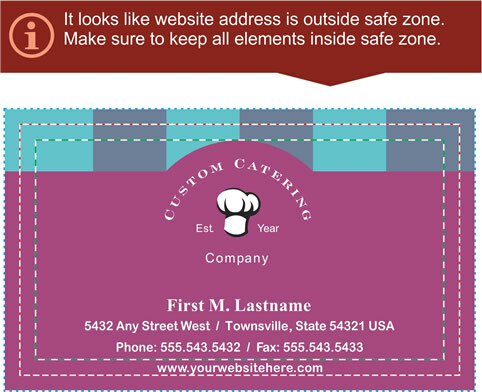 You will need to make sure that all of your elements are withing safe zone and that background is stretched to the edges of the online template.